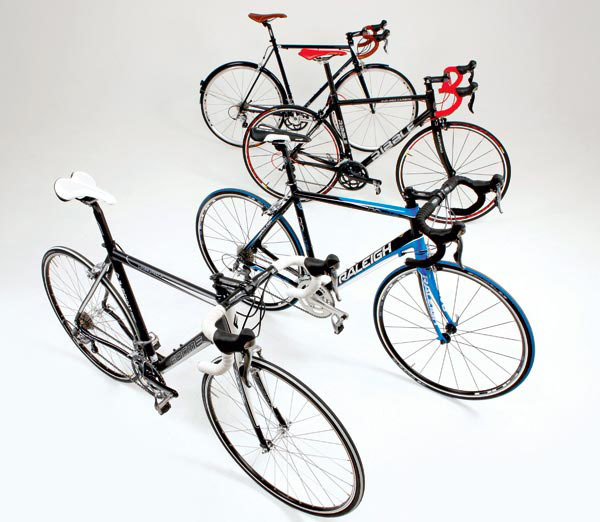 As it’s 2012 and we’ve been busy showing the world that no one does it better (though it’s anyone’s guess exactly what ‘it’ is) we’re featuring four British bikes in the grouptest. That way we’re not only going to assure a British winner, but we’re going to bask in the reflected glory of a podium clean sweep, and fourth place to boot. Taking our cue from Danny Boyle’s ‘glorious mess’, as one commentator described it, we’ve got bikes made from different materials — there’s steel, aluminium and carbon here. However, all four have equipment based around Shimano 105 and all have drop bars and 10 gears, but just like the British, they don’t quite belong together and so we’ll attempt to ignore that bit. Britain may have seen a century of managed decline but Raleigh’s recent fortunes have been more like the women’s Olympic road race — built up by the British only for the Dutch to walk away with the spoils. However, to be fair to gold medallist Marianne Vos as well as Raleigh’s new Dutch owner Accell group, they are both experienced and capable. We’ll use the aluminium Airlite 400 as a sampler of how Raleigh is faring under new management. Derbyshire’s Forme is a product of the revival of interest in cycling. In only two years the company has gone from being politely well received to gaining a well deserved reputation for its good-value, well-designed bikes. We look at the Longcliffe 1.0, a mostly 105-equipped aluminium all-rounder. Preston-based Ribble, the northern hardman’s choice, supplies a carbon-framed competition-orientated machine that looks like an unbeatable bargain for just under £1k. And lastly from Charge, the fashionista’s choice, comes the Juicer Hi — a traditional-looking steel bike with subtle but edgy graphics and matching steel mudguards that looks as though it could do urban accessory just as well as winter hack. Now the time has come to stand for ‘God Save The Queen’.